Ultrasonic irradiation-based mechanochemical strategies have recently been the subject of intensive investigation because of the advantages they offer. These include simplicity, energy savings and wide applicability. Traditional areas of sonoprocessing such as cleaning, efficient mixing and solid activation have been extended to both macromolecular and micro/nanostructures, some of which are biologically significant, ultrasound-responsive actuators and crystal design, among others. Unlike conventional mechanochemical protocols, which require little solvent usage if any at all, mechanical (and chemical) effects promoted by ultrasound are observed in a liquid medium. Tensile forces, which share similarities with solid mechanochemistry, are generated by virtue of nonlinear effects, notably cavitation, when high-amplitude waves propagate in a fluid. 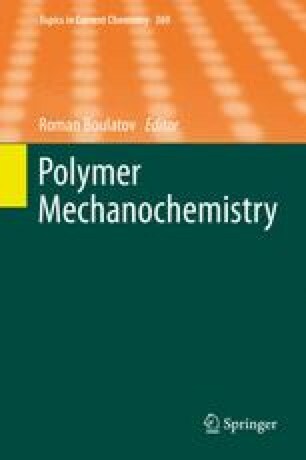 This work aims to provide insight into some recent developments in the multifaceted field of sono-mechanochemistry using various examples that illustrate the role of ultrasonic activation, which is capable of boosting hitherto sterile transformations and inventing new crafts in applied chemistry. After a preliminary discussion of acoustics, which is intended to provide a mechanistic background, we mainly focus on experimental developments, while we often mention emerging science and occasionally delve into theoretical models and force simulations. Financial support from the following agencies is gratefully acknowledged: University of Turin (fondi ricerca locale 2013) and the Junta de Extremadura-FEDER (Ayuda a Grupos Consolidados, Grant No. GR10049). The authors are also deeply indebted to Dr. David Fernández-Rivas (University of Twente, The Netherlands, and BubClean) for his stimulating feedback and permission to reproduce Fig. 4.